Winery is owned by winemaker Heidi Barrett. Great line-up of wines; Cabernet Sauvignon, Le Barrettage Rhone style blend, Grenache, Moscato Azul (dry Muscat Canelli), and two proprietary red blends, Pirate TreasuRed and Art Bus . Small case production wines of the highest quality, made with finesse and balance. Sister winery is Barrett & Barrett, a partnership between winemaking husband/wife team, Bo and Heidi Barrett. 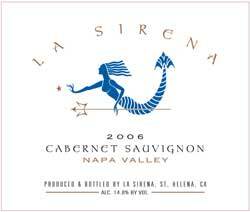 Contact David@lasirenawine.com for private visit and tasting. Several options from a sit down cave experience, casual couch area, or great room location.